The Bunak of Indonesia are located in the central interior of Timor Island in the province of Nusa Tenggara. They are one of the major people groups on the island. They are also located in East Timor. Their language, which is also called Bunak, is not closely related to any other language. There is little information concerning the specific lifestyle and culture of the Bunak; however, it is assumed that they are very similar to other aboriginal groups living in Timor. The island of Timor is about 280 miles long and up to 65 miles wide. At 9,679 feet, Mount Ramelau is the highest point. Almost all of the island's precipitation falls during the monsoon season, which occurs from December to March. The soil is generally poor, and natural vegetation is sparse. There are, however, valuable forests of eucalyptus, sandalwood, rosewood, bamboo, and teak. The Portuguese settled on Timor in the early 1500s, and Dutch traders first landed on the island in 1613. The Portuguese and Dutch competed for influence until a series of agreements established boundaries between their holdings. Dutch Timor, centered in the west, became part of the Republic of Indonesia in 1950. Portuguese Timor, centered in the east, was forcibly annexed by Indonesia in late 1975. The economy of Timor is dominated by agriculture. Cultivation is by traditional methods, and the chief products are maize, rice, coffee, fruit, and copra (dried coconut meat yielding oil). 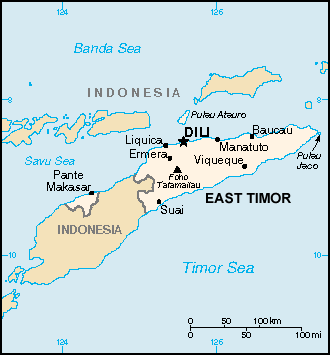 The coastal inhabitants of Timor are largely of Indonesian-Malay descent. They have driven the predominantly Melanesian aborigines (such as the Bunak) to the mountains. Bunak villages often consist of individual settlements. In the mountains, the people live on swiddens (land that has been cleared by "slash and burn" agriculture) for part of the year. After harvesting the crops, however, they return to their home villages. Each village has a sacred house, with a custodian priest and a surrounding taboo area. Because of former coastal warfare, villages and isolated houses are surrounded by stockades. Bunak descent is traced through both the males and females, and the circle of kinship is divided into various sub-groups. The center, however, is the nuclear family, composed of a man, woman, and their children. Islam is the dominant religion in Indonesia today and is practiced by much of the population. Before the 1300s, Hinduism was widespread in the area but is now practiced by only a small number of people. A number of the country's population is Christian, primarily Protestant. Many of the Chinese follow Buddhist-Taoist teachings. Animistic religions (belief that non-human objects have spirits) are still followed by tribes in remote areas, such as the Bunak. Headhunting has only recently been suppressed. The Bunak also practice ancestor worship (praying to deceased relatives for guidance, blessing, and protection). There are claims that more than 100,000 people may have been killed by the Indonesian army during the annexation of Timor. Political tensions in the region led to a massacre of protesters by Indonesian soldiers in 1991. 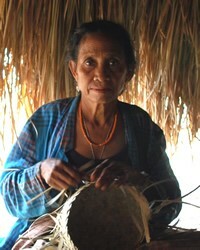 Many of the islanders need to experience emotional healing. The Bunak have no Christian resources available in their own language. However, there are two missions agencies currently working among them. Bible materials need to be translated into their language, and the missions work must be extended. Only then can the Bunak find true peace in Jesus. * Ask the Lord to send loving Christians to minister the peace of Jesus to the Bunak. * Ask the Holy Spirit to grant wisdom and favor to missions agencies focusing on the Bunak. * Pray that signs and wonders will follow the Bunak believers as they share Christ with their own people. * Ask the Lord to bring forth a strong Bunak church for the glory of His name! * Pray for Gospel messages to become available in audio format for this people group.View Bunak in all countries. Location in Country: Ainaro district: Zumalai subdistrict; Bobonaro district: Maliana south; Cova Lima district: on Timor island central interior, south coast, north of Suai town.